While driving in Manhattan a couple of weeks ago, I saw this truck. 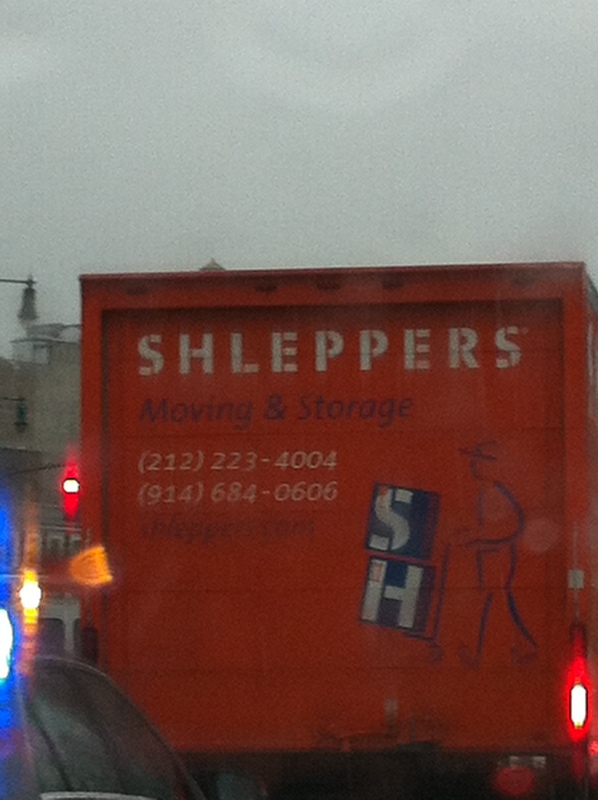 The name of the company made me smile -“Shleppers”. A perfect name for a moving company. I like the word “shlep”. I feel it as I say it. It is very descriptive. I used it many times when my daughters were young. I remember shlepping the kids from one place to another. The image that comes to mind is holding little hands, carrying many bags – diaper, school, grocery and walking at a speed that was a little too slow for my long legs and probably a little too fast for their little legs. The word is in dictionary. It is slang and it means to carry, take, haul, drag, to go or move with effort. Schlep can be spelled with or without a “c”. WordPress kept wanting to add the c.
Shlep made me think of another very descriptive word -hoopla. I like that word too but I use it in the context of no hoopla. Hoopla is a word I really see and feel. All that extra stuff you don’t really need, all the drama, the fluff, the over the top “ness” of events. Dance recitals, weddings, bridal and baby showers, parties can all fall victim to hoopla. By definition hoopla is 1. great excitement; bustle 2. showy publicity; ballyhoo. Now there is a word to investigate ballyhoo. I will leave that to you to do. Did you know this is National Parks’ Week – April 20 – April 28? The weird thing is I had already decided to write about the National Parks before I was aware of that fact. I went to the website to investigate a couple of things and realized it is National Parks Week. In the summer of 1996, my husband, my two daughters, our dog and I did what we called “our National Park’s Tour”. We were away from June 23 – July 27. We traveled 6,264 miles. Bruce actually drove all those miles because the truck was not automatic and we were pulling a pop-up trailer. We drove through 15 states. Saw license plates from 49 states, 7 Canadian provinces, the District of Columbia and even a diplomatic plate. The only state license plate we never saw was Vermont. There are many stories to tell but since it is National Park Week I will mention two things about the National Parks that you may not be aware of. Our National Park Service offers a Junior Ranger Program for kids. And an organization called A Christian Ministry in the National Parks (ACMNP) offers Sunday church services from Memorial Day to Labor Day in 25 different National Parks. The Junior Ranger Program involves a booklet that suggests and includes activities that are designed to help children learn and enjoy the park. There are stickers, maps, wildlife facts, and fun ideas. When your child completes the booklet, they present it in the visitor center and receive their Junior Ranger badge or certificate from the park ranger. When my girls finished the program at Mount Rushmore, the park ranger asked them where they lived and had they ever been to the National Park in their own backyard. Thankfully they had been and they knew it was the Statue of Liberty. At Yellowstone National Park, the park ranger called the entire visitor center to attention so she could award the Junior Park Ranger badge to my daughters. Emily was cringing and Meghan was beaming and Mom was in trouble with Emily. I don’t remember how we discovered there was a church service at Mount Rushmore but I am so glad we did. My family and about 30 other people sat in the same amphitheater that would later hold hundreds of people at the evening lighting of Mount Rushmore. Both the morning service and the evening lighting were amazing and worthwhile experiences. ACMNP states: “Our volunteers come from over 100 college campuses and 30 seminaries, in 35 states, representing more than 30 Christian denominations.” The young people did a great job leading the music. The young man who spoke made me smile because someone must have told him to make sure you look at “all the people” when you speak. The amphitheater at Mount Rushmore is huge so in his attempt to look in all directions he kept his feet still and kind of pivoted around in a half circle and pivoted back the other way. He reminded me of a sprinkler. We also attended service at a campground at southern entrance to Yellowstone National Park. That service was on log benches along the Snake River. It was absolutely beautiful. Since it was outside our dog attended. After the service, we joked that we had supplied future sermon material. Some day that young preacher would tell the story of preaching at a campground and a dog howling/singing during “Amazing Grace” – too funny. Tourist Tuesdays is now Travel Tuesdays and today is dedicated to Boston. As a new day dawns may I continue to pray for the runners, spectators, first responders, medical personnel, chaplains, visitors and residents who have been forever changed by the bombings at the Boston Marathon. Will you join me? Some physical injuries will take a long time to heal, some emotional injuries will take a long time to process and heal may I not grow weary in praying, listening for opportunities to help and caring for my neighbors near or far. Will you join me in praying, listening and caring in the days, and weeks ahead? I have visited Boston as adult and I have found it to be an easy city to navigate especially when your college age daughter is your tour guide. The “T” is a convenient mode of travel. I would suggest the Freedom Trail for your dose of history, Faneuil Hall Market Place for shopping/eating and the Aquarium for kids. The swan boats are fun to see and a great opportunity to read Make Way For Ducklings. I love just wondering the streets and realizing how old so much of the city is. I am grateful for the people who shaped our nation on those streets. I pray that the events of yesterday will not cause us to be so fearful that we miss all Boston has to share with us. For now, may we continue to share our prayers and thoughts with Boston’s people. Today the local church (WVCN) I call home “visited” another church. We had our service with Union A.M.E. Church. It was a wonderful time of worship. I truly believe God glanced down and said “Hey! everybody gather around and look at Warwick, NY, the kids are praising me as I always intended.” Thank you Pastor Bruce and Pastor Kevin for an amazing morning. May it be the beginning of kingdom life in Warwick. Looking at your surroundings may help more than staring at the map. Years ago, a friend and I were at the Arc de Triomphe in Paris. We wanted to go to the Eiffel Tower so we were studying the map. A police officer asked us if we needed help. This conversation was in French on his part and very limited French/English on mine. We asked “where is the Eiffel Tower?” He smiled, pointed behind us, and said “un, deux, trois” meaning any of the roads would take us there. It was right behind us?!? Some airports close at night. In 2005, my daughters, the same friend as mentioned above, her daughter and I flew into Billings, Montana. As we walked away from the gate, they were turning off the lights behind us. Also always check that the rental car headlights are on or you will be stopped by the police in the first moments of your vacation. First class is a cool way to fly. Wide leather seats, real utensils, hot towel, cookies and milk. I have only flown first class twice but awesome. No matter where you take your kids, the hotel or campground pool is the most exciting part. There are 6 states I haven’t visited and would like to so I can say I have been to all 50 states. I haven’t been to: Mississippi, Louisiana, Alabama, North Dakota, Idaho and Hawaii. 1. Stick figures on rear windows: These seem to be very poplar on SVU’s and crossovers probably because children talk their parents into buying them. I have seen the Disney version, the alien version, 2 parents and 8 children version and the family with the pets version. They are cute and definitely better than the “my kid did_____” bumper stickers but the set that was disturbing was a little boy, a mom with no head and a dad holding the mother’s head. Obviously there is some issue but really does your child need to see that every time they get in the car and it makes me think you are an axe murderer. 2. Temperature is relative: Hearing that the temperature is going to be in the sixties is exciting this time of year but a few years ago reading that it would be in the sixties when I was in Alaska had me packing my polar fleece and warm pajamas. 3. Panera Bread serving pasta doesn’t seem like a good idea. Soup, salads, sandwiches and mac & cheese but pasta – not so much. 4. Since my trip to Washington DC a few weeks ago, I have come to the realization that the people represented by statues didn’t set out to have a “statue of themselves”. They did the right thing, made difficult decisions, fought the good fight and sacrificed for the good of all. They may even think what they did is not worthy of a statue or memorial. Unfortunately I think in today’s world there are people whose goal is to have a “statue”. Over the past year I have taken advantage of being a tourist in my own city – New York City to be exact. I have found since I have been leading tours at the Tribute Center I am more apt to go on tours when I visit places. With friends from the Tribute Center I have toured Grand Central Station, the Waldrof Astoria and the Brooklyn Museum. It has really been great fun. I have learned some interesting things and had a great time exploring. Last July, Emily, my daughter, and I did a tour about space travel at the Intrepid Air and Space Museum. We were there within days of the Space Shuttle exhibit opening – amazing. Worth doing. Also I enjoy discovering local places to eat. One of my friends from the Tribute Center is excellent at finding restaurants for lunch. I so appreciate all the work she does coordinating our adventures. When Meghan, my daughter, and I were in Washington DC a few weeks ago, we asked at the front desk for a suggestion of a place to get a good burger but not a chain restaurant. The gentleman suggested a place that had the “best burgers in DC” and supplied us with directions. We arrived at said *restaurant and commented to each other that it was strange that they suggested a restaurant that was in a competitor’s hotel. We each ordered a burger which was really very tasty and not overly expensive. Success, we just had the best burger in DC. We continued on our way to meet up with the night tour we were taking and as we are crossing the street we see another establishment with the exact same name. Meghan and I burst out laughing. We are pretty sure we just had the best burger in DC at the wrong place. When the credit card bill arrived, it was confirmed we had the best burger in DC at the wrong place. Ah!! the power of suggestion. So my question to you is, where should I visit in “your city” and where can I get a “good burger” or a “nice cup of tea” in your part of the world? * In DC there is a Hamilton Crown Plaza Hotel which has a restaurant and a restaurant called The Hamilton.